Unique in shape, this Fairtrade 9 carat rose eternity ring comprises multiple marquise shapes. Seven 1.5mm round brilliant cut G-H, VS diamonds have been grain set along the band in alternate marquise shapes. The diamonds have a total weight of 0.10ct. Intricate mill grain and beading detail enhances each of the curved sections and adds another dimension to the design. 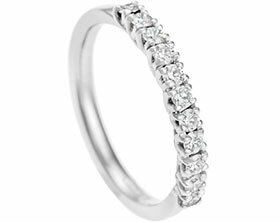 A polished finish completes this feminine and timeless eternity ring.